A mosaic of images showing the view northward and northeastward from "Greeley Haven," the overwintering site for NASA's Opportunity Mars rover. Opportunity took the photos with its panoramic camera in mid-January 2012. A NASA rover celebrates eight years on the Martian surface today (Jan. 24), and the long-lived robot is still going strong. The Opportunity rover landed on the Red Planet at 9:05 p.m. PST Jan. 24, 2004 (12:05 a.m. EST Jan. 25), three weeks after its twin, Spirit, touched down. While NASA declared Spirit dead last year, Opportunity continues to gather data in its dotage, helping scientists understand more and more about Mars' wetter, warmer past. "It is amazing. I have to remind myself — my God, this thing is still going!" said John Callas, Opportunity's project manager at NASA's Jet Propulsion Laboratory in Pasadena, Calif. "But more importantly, it is still very productive on the surface." Spirit, for example, found strong evidence of an ancient hydrothermal system. The discovery showed that at least some areas on Mars once had two key ingredients necessary to support life as we know it — liquid water and an energy source. Opportunity, for its part, recently found clues that warm water may also have flowed or percolated on the rim of Mars' huge Endeavour Crater long ago. The golf-cart-size rovers just kept chugging along, continuing to make observations years after their warranties expired. Spirit got mired in soft sand in May 2009, after a bad wheel compromised the rover's mobility. The robot failed to maneuver into a position that would have slanted its solar panels toward the sun over the course of the 2009-2010 Martian winter, and it stopped communicating with Earth in March 2010. NASA declared Spirit dead in May 2011, identifying hypothermia as the likely cause. But Opportunity remains an active and alert planetary explorer. NASA's Opportunity Mars rover took this mosaic of images with its panoramic camera in mid-January 2012. 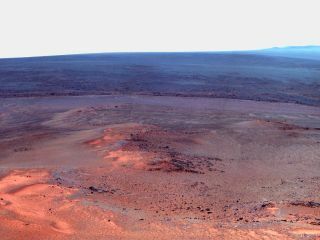 It shows the windswept vista northward (left) to northeastward (right) from the location where Opportunity is spending its fifth Martian winter, an outcrop informally named "Greeley Haven." After a three-year trek, Opportunity arrived at the 14-mile-wide (22-kilometer) Endeavour Crater in August 2011. The rover spent the next few months poking along Endeavour's rim, where it recently uncovered what researchers say is the best evidence yet for liquid water on ancient Mars. In December, Opportunity found a good spot to wait out the looming Martian winter — a rocky outcrop informally named Greeley Haven. The location allows the rover to tilt its solar panels northward at about 15 degrees, maximizing the power it can draw from the sun to stay warm, active and healthy, researchers said. Opportunity isn't sleeping the winter away. It will stay awake though relatively stationary, investigating the rocks at Greeley Haven and taking panoramic pictures of its surroundings. And, most importantly, it will beam radio signals home to Earth. Mission scientists will track those signals, using Opportunity's motion relative to Earth as a proxy for the rotation of Mars, Callas said. Scientists should thus be able to get very precise measurements of the planet's spin. They'll use that information to draw inferences about Mars' mysterious interior structure — how big the planet's core is, for example, and whether that core is liquid or solid. At that point, the plan is to send the robot south along Endeavour's rim, toward a place about 1.8 miles (3 km) away called Cape Tribulation. Mars-orbiting spacecraft have detected clay minerals — which form in water — at Cape Tribulation, so the team wants Opportunity to investigate the area. "It speaks a lot to the biopotential and habitability of Mars in the ancient past," Callas told SPACE.com. "We want to go there. It's on some challenging slopes, some 30-degree slopes, and we'll have to do some Martian mountaineering. So it'll be a spectacular adventure with the rover to get to these locations." Mission scientists are eager to explore large swaths of the huge crater, which offers a wealth of possible new discoveries. "Endeavour is like a whole new landing site, and we've really only just scratched the surface so far," rover principal investigator Steve Squyres, of Cornell University, told SPACE.com in an email. Despite an arthritic joint in Opportunity's robotic arm, the rover is in good health overall, Callas said. Still, the mission team isn't taking the aging robot's continued performance for granted. "Every day is like a gift," Callas said. "We just keep charging ahead as if every day is our last day, and we want to maximize the science we can do with this vehicle." While science remains the team's top priority, Callas said he'd like Opportunity to tick off one big exploration milestone as well. The Soviet Union's Lunokhod 2 robot currently holds the record for the greatest distance traveled on the surface of another world. The unmanned rover covered 23 miles (37 km) on the moon in 1973. Opportunity's odometer currently reads 21.35 miles (34.4 km). "I want to beat that record," Callas said. "After the winter, I hope to knock that record off and claim the mantle of the longest distance traversed by another vehicle beyond the Earth."